Today, Monday, February 4th officially marks the launch of the second annual national Black Lives Matter At School week of action. Supporters will be posting their photos, lesson plans, and stories of the day on social media with the hashtag, #BlackLivesMatterAtSchool. The four demands of the movement are: 1) End “zero tolerance” discipline, and implement restorative justice; 2) Hire more black teachers; 3) Mandate black history and ethnic studies in K-12 curriculum; 4) Fund counselors not cops. 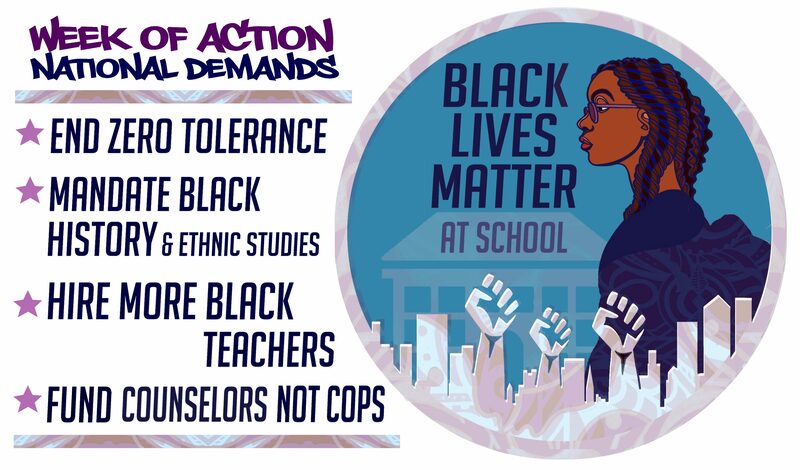 The Black Lives Matter At School national committee has complied many lesson plans that match the themes for the week and has come out with new 2019 Curriculum Resource Gide. You can watch and share the new BLM@School video, “I know my people are strong” to get hyped for the week. In addition, there is a Black Lives Matter At School starter kit to help educators be ready for the week. There are many different ways to participate in Black Lives Matter at School week. Some educators teach BLM lessons every day of the week, wear their Black Lives Matter At School t-shirt, organize after school rallies, facilitate their students entering the creative challenge, develop curriculum, post on social media, and rally at the school board meeting. Other educators new the to movement sometimes begin by taking on one or two of these actions. One easy way for everyone to participate is to sign the petition endorsing the week of action.